"Keep it in the ground" activists protesting the Bayou Bridge Pipeline on February 17, 2018 near Belle Rose, Louisiana. 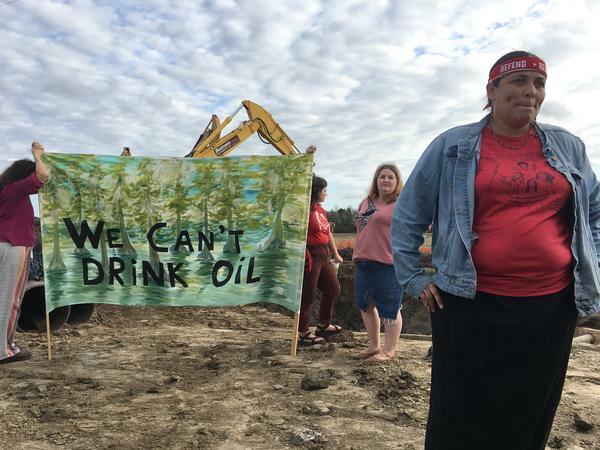 Activist Cherri Foytlin vows to physically block construction of the Bayou Bridge Pipeline in Louisiana. Here's the idea underpinning the "keep it in the ground" movement: To address climate change, activists say known reserves of fossil fuels will have to be left untouched instead of burned. In the meantime, they want countries to transition to renewable forms of energy such as solar and wind. For oil, activists figure that if they can stop pipelines and other infrastructure from being built, it's more likely crude will be left in the ground, because there won't be a way to transport it to where it can be sold. 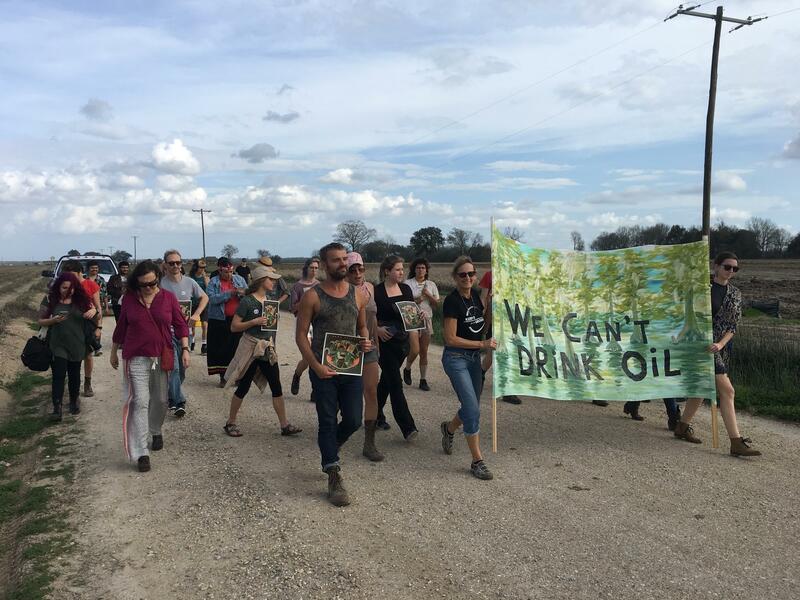 One tactic used to block pipeline construction is protests like those against the Bayou Bridge Pipeline in Louisiana. Last month organizer Cherri Foytlin led cheers of "L'eau est la vie"—"water is life" in French — near Belle Rose, Louisiana. Environmental groups sued to stop construction of the pipeline, but if building continues, Foytlin says she's prepared to physically block it. "We're poor people. We don't have a lot of money like they do. All I have is this old body. ... So I'll use this old body now to do what I have to do to stop it," she says. Protesters say President Trump's pro-fossil fuel agenda makes their job harder, but he also motivates the base. A day after Trump failed to mention climate change in his State of the Union speech, Vermont Sen. Bernie Sanders fired up a crowd of activists at George Washington University by mentioning Trump and his Cabinet appointees who lead the administration's energy and environment policies. "What we are about is telling Donald Trump and the Koch Brothers and all of these other people that their days are numbered — fossil fuel's days are numbered. We are going to transform our energy system," Sanders said as the crowd cheered. Activists with groups like 350.org are petitioning cities to become "fossil free," and they're encouraging institutions — especially colleges — to withdraw investments in oil companies. But people in the fossil fuel business don't sound impressed. "Keep it in the ground — as a movement — has been a failure," says Texans for Natural Gas spokesman Steve Everley. Everley says the current drilling and production boom is proof of that failure. Domestic drillers have doubled oil production in the past decade and natural gas is up by about a third. The country is on track to produce even more oil than Russia and Saudi Arabia. "We're not going to undermine the most significant shift in global energy power in a generation to pursue a job-destroying fringe political campaign like 'keep it in the ground,' " says Everley. Still, the industry has responded to the movement with a public relations campaign, including television advertisements touting the economic benefits of fossil fuel infrastructure. Seth Whitehead leads the industry-backed Energy in Depth campaign and says stopping domestic oil and gas production makes no sense as long as demand continues to rise. "It's better for us to produce it here in the United States rather than import it from countries with much more lax environmental regulations," says Whitehead. Keep it in the ground activists point to one key victory as proof their strategy can work: Canada's oil sands. Five years back, there were big plans to expand production of oil sands — also called tar sands. But activists rallied opposition by pointing out that it would require more energy than traditional drilling, and so would emit more pollution. Stephen Kretzmann with Oil Change International says opponents have successfully delayed construction of the Keystone XL pipeline for years now. "And now because investors — because companies — recognize that there is virtually no way to get a new pipeline that would get that oil to market, we're seeing people be less interested in growth in the dirtiest source of oil on the planet," says Kretzmann. That's true, so far. President Trump approved a permit for the pipeline and the company TransCanada now is deciding whether to go ahead with the project. 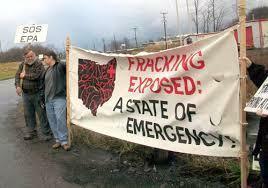 Still, interim victories like this invigorate keep it in the ground activists. They're promising more campaigns and protests, even as analysts predict the U.S. is on track to break even more oil production records. The U.S. could soon be the largest oil producer in the world. It's already pumping out more than 10 million barrels of crude a day. That breaks a previous record set back in 1970. Despite this, climate change activists who oppose more fossil fuel production insist that they are making progress. Here's NPR's Jeff Brady. JEFF BRADY, BYLINE: Here's the idea underpinning the Keep It In The Ground movement. Activists figure that if they can stop pipelines from being built, it's more likely that crude will stay in the ground where it won't contribute to climate change. A key tactic is protests, like this one in Louisiana last month. UNIDENTIFIED WOMAN: (Shouting in French). UNIDENTIFIED PEOPLE: (Shouting in French). BRADY: They're shouting, water is life, in French. The pipeline is called the Bayou Bridge, and environmental groups sued to stop it. But if it goes ahead, protest organizer Cherri Foytlin says she's prepared to physically block construction. CHERRI FOYTLIN: We're poor people. We don't have a lot of money like they do. So all we have is, all I have, is this old body. Right? So I'll use this old body now to do what I have to do to stop it. BRADY: Protesters say President Trump's pro-fossil fuel agenda makes their job harder, but he also motivates the base. A day after Trump failed to mention climate change in his State of the Union speech, Vermont Senator Bernie Sanders fired up a crowd of activists at George Washington University. BERNIE SANDERS: What we are about is telling Donald Trump and the Koch brothers that their days are numbered. Fossil fuels' days are numbered. We are going to transform our energy system. 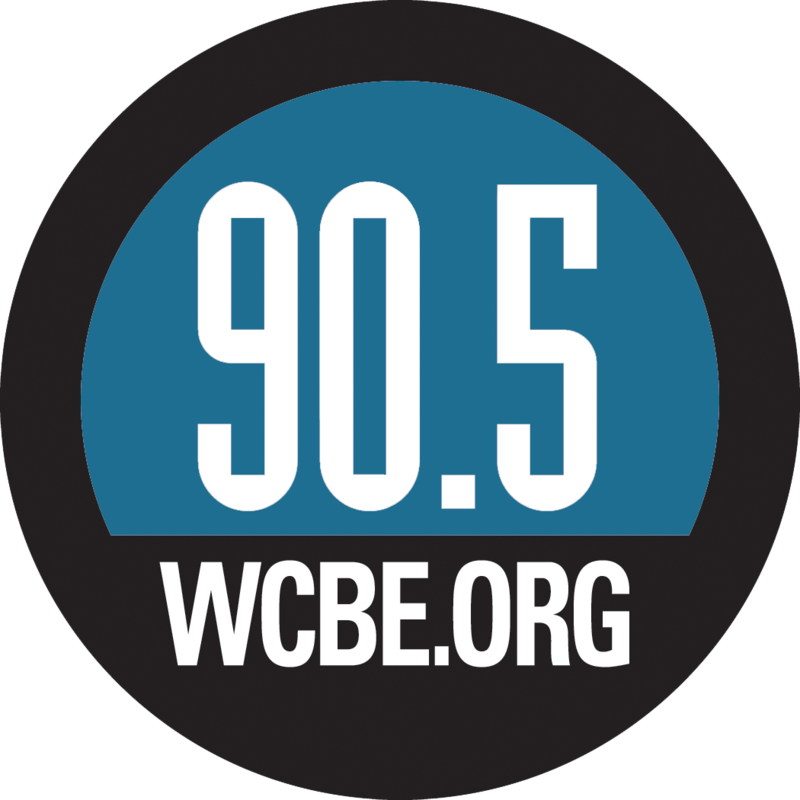 BRADY: Activists also are petitioning cities to become fossil free, and they're encouraging institutions, especially colleges, to withdraw investments in oil companies. But people in the fossil fuel business don't sound impressed. STEVE EVERLEY: Keep It In The Ground as a movement has been a failure. BRADY: Steve Everley is with Texans for Natural Gas and says the current boom is proof of failure. Domestic drillers have doubled oil production in the past decade, and natural gas is up by about 1/3. The country is on track to produce even more oil than Russia and Saudi Arabia. EVERLEY: We're not going to undermine the most significant shift in global energy power in a generation to pursue a job-destroying, fringe political campaign like Keep It In The Ground. BRADY: Still, the industry has responded to the movement with ads like this one. UNIDENTIFIED NARRATOR: America's pipelines bring American energy to American families. BRADY: Seth Whitehead leads the industry-backed Energy In Depth campaign, and says stopping domestic oil and gas production makes no sense because demand continues to rise. SETH WHITEHEAD: It's better for us to produce it here in the United States rather than imported from countries with much more lax regulations, environment regulations, in countries that are hostile towards the United States. BRADY: The activists can point to one key victory as proof their strategy works, Canada's oil sands. Just a few years back, there were big plans to expand production. 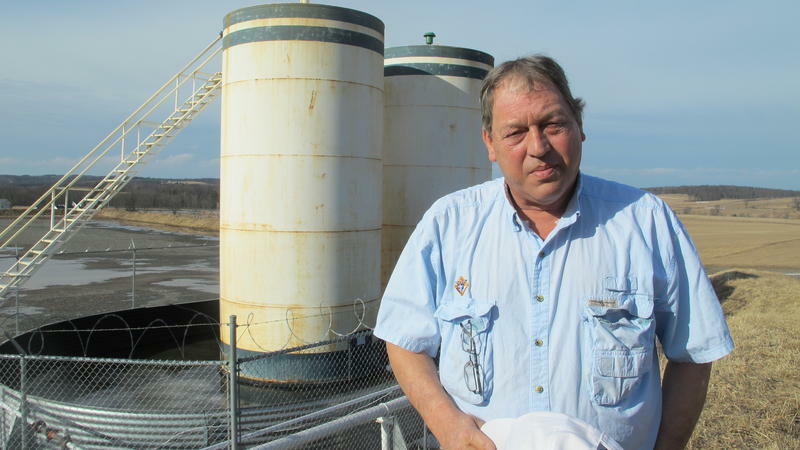 Opponents point out oil sand's crude emits more pollution because it requires more energy to produce than traditional drilling. They have successfully delayed construction of the Keystone XL pipeline, says Steven Kretzmann, with Oil Change International. STEPHEN KRETZMANN: And now because investors, because companies recognize that there is virtually no way to get a new pipeline that would get that oil to market, we're seeing people be less interested in growth in the dirtiest source of oil on the planet. BRADY: That invigorates Keep It In The Ground activists. They're promising more campaigns, more protests, even as analysts predict the U.S. is on track to break even more oil production records. Jeff Brady, NPR News. Transcript provided by NPR, Copyright NPR. Earlier this month workers on the Rover natural gas pipeline project saw drilling mud disappear underground in Stark County. The Ohio Supreme Court has upheld the Mahoning County Board of Elections' decision to reject another ballot measure that would have allowed Youngstown voters to ban fracking.